The 1940s were tumultuous times in Beaver Dam. Recovery from the Depression was finally in sight, driven by the dreaded war preparation. October 1940, the local Company E, 128th Infantry, 32nd Division was called up for duty to Camp Beauregard, Alexandria, Louisiana. They boarded the train at the Beaver Dam North Junction after a parade from downtown with the Legion Band and Color Guard, the High School Band and the Eagle Drum Corps. 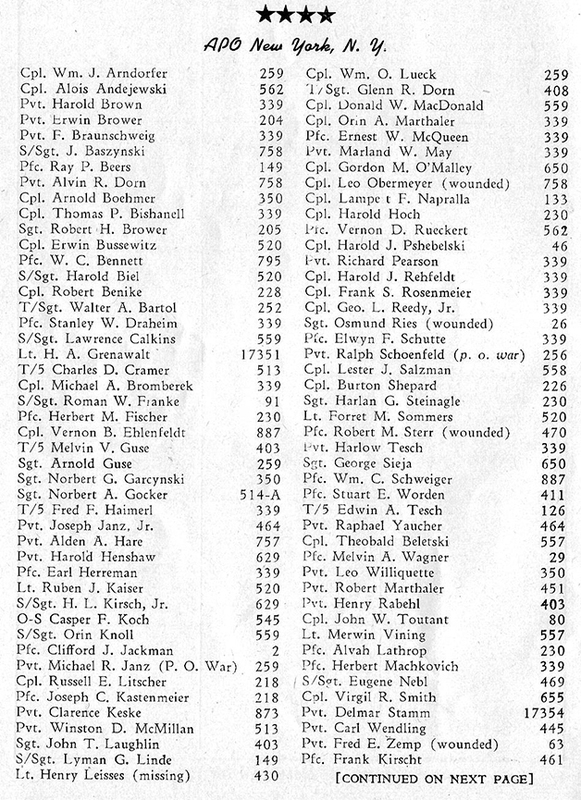 They left with four officers, Captain Sam Horton, First Lt. Donald Rogers, 2nd Lt. Orin Rogers and 2nd Lt. Joseph Stehling, and 76 enlisted men. Beaver Dam practiced a blackout air raid drill on July 1, 1941 at 9:30 p.m. All cars were to stop and turn out lights. All lights in homes and businesses to be turned off or windows covered. It was a great success. Locally Beaver Dam was adjusting its mindset to inescapable war and was also planning a 100th birthday party for itself to be held on July 3-6, 1941. War became reality on December 7, 1941. Late spring 1942, a plane crashed while practicing bombing at the Beaver Dam sod airport located near the north end of De Clark Street during which Courtney Starkweather was injured and later died. Hundreds of Beaver Dam and Dodge County youth would be caught up in a world now out of control. Beaver Dam was forced to go on a full wartime footing; protecting its water system, electric grid, phone system, Beaver Dam Lake dam, factories and airport with special security. Military guards appeared in factories and vigilant local civil defense people hovered over the community. Block Wardens faithfully patrolled their assigned sections of Beaver Dam. Williams Free Library tower was set up as a military outpost, code named Bravo Poppa, devoted to monitoring and identifying all friendly and unknown airplanes flying over the community for the war’s duration. July 1942, a flock of chattering Eagles were gathered at 118 Rowell Street pondering the birth of an extraordinary baby. Their nest was called the Fraternal Order of Eagles Club Aerie No. 1638 and the new baby was named: The Eaglet. This Eaglet would soar around the world bringing humor, news, Beaver Dam gossip and Eagle members together for the war’s duration. It was a stunning little magazine that was chock-full of hometown humor and news, providing a great forum by which Beaver Dam soldiers kept track of each other across the world. It was divided into special sections. The Yanks have landed again, this time in Australia and I am with them. The rest of the gang have transferred to other units. Today it turned cold and you should see the southern boys pack the clothes on, we are used to it so we don’t mind it so much. The camp isn’t bad and so far the grub has been okay, plenty of good fresh milk, cheese and butter, just like home. Beer, well that’s another story. Budweiser would have to work overtime to better it, it’s plenty powerful and cheap. It’s going to take a long time for mail to reach us Gib, but if any of the old gang would care to write we’d appreciate hearing from them and of course we’ll all look for the Eaglet every month, so don’t forget us. Have met quite a few of the Australian Aussies and can honestly say they are good friends as well as soldiers, very polite and helpful, in more ways than one. Talked with a lot of them that have just returned from Malaya and Singapore, also some who were in Libya and Syria, and they sure can tell some hair-raising stories. Time is short Gib, so will close…hoping to hear from you or some of the gang soon. Best of luck and good wishes. Sgt. 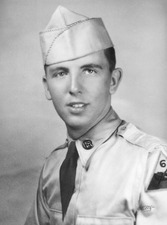 M. Gurney. Letter dated November 3, 1944: Peter Janz comments on Philippine invasion. Dear Gib and Brothers: By this time you should know that I was in on the Philippine invasion. Take it from me, it was no easy job. I’ve dodged so many bullets that it isn’t funny. At times there was so much lead flying around that it is a miracle that I am alive. The Good Lord above must have been watching over me. Digging foxhole after foxhole is merely routine but surely a life saver. It gets so hot here that a fellow sweats even in the shade… The natives were so overwhelmed with joy to see us land that I can’t begin to describe how much this means to them. THE “HOMEFRONT” SECTION OF THE EAGLET: Servicemen and women enjoyed reading about the good fishing on Beaver Dam Lake, Pa Jones winning the championship in the fish-skinners contest, and humor about local people. Humor softened the scourge of war. The Eaglet was a source of humor, a letter depot, a news network and a link to home, a precious first hand history record of Beaver Dam area servicemen and women stationed throughout the world. Seventy plus years later, we look back in awe at our community. They were fighting the most difficult war ever known on this earth and this little book records our local history in a unique, humorous way. If you enjoyed this little gem, visit the Veteran’s Museum at the Dodge County Historical Society. 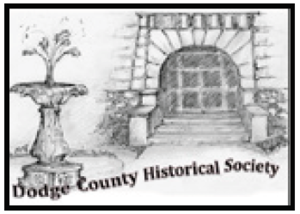 The Dodge County Historical Society is located at 105 Park Avenue in Beaver Dam, Wisconsin. It is open to the public from 1-4, Wednesday through Saturday. Admission is free.